They say that to firewalk sucessfully you have to keep going. Be calm. Stay focused. Keep moving towards the goal. I may have learned to firewalk this week. I decided that I would lump the CSM stuff into one post a week. That way I could load the post through the week while the rest of my blog had to stay focused on all of the other random things that come to mind. It also creates a side project that will follow my running process. Last year we had a pre-election which narrowed down the list to those seriously running. There was an application period This year, we do not yet have the rule list but I suspect it will be similar. It also means that not everyone who speaks up to run may be able to run in the final race (depending on number). When I put my "I'm running" post up in Jita Park Speakers Corner I am not sure what I expected. I spent a day and a half wavering between posting and waiting, posting and waiting. It is similar to those days when you get somewhere before anyone else and start to wonder, “Did I get the timing wrong?” But I was burning with excitement. I had made a decision and I wanted to move from there. It went in what might be called a different direction. My nervous energy won and I posted my thread first. I wanted to wait for someone else to post. But, time was ticking down, February was half over and no one had posted. I had decided and spent two weeks scratching away at what I hoped was a reasonable entry into the arena. I hate sitting once I am ready to go and finally I gave in and dove in to much nervousness and butterflies in the belly. I shared the link and I went to bed. In the morning I had a few questions. They were tough questions. I set up a google folder and placed each question into a separate document so that I could focus on them and write them without the forum eating them. I figured that I would work on them with free time at work and that evening. There were a lot of questions and a lot of "how will I fix this, what would I suggest for that, how would I make this happen." If I could but change the world and direct CCP. But, the current CSM members jumped in to comment that the CSM advises and suggests but does not control. In my mind I had pictured something along the lines of my going on about how if this is a community focused topic that it needs to be brought to CCPs attention along with lists of suggested action plans and resolutions as well as reasons why it is a problem. It is why I change my 'interest' list from 'agendas'. Agenda sounded like I was going with a mission to fix this handful of stuff that I wanted as my pet projects. A perfect example of this is boosters. Boosters are a pet project that I am interested in but with everyone pointing at :cloaky stabbed frigates in Faction Warfare” boosters go off to the side. It is nice that I like them but it isn't Sugar Online. But once I started, things just started to flow. I was humbled by the amount of support that I received and overwhelmed with gratitude. People had taken the time to read what I said. Others, who have followed my adventure in this game also responded. And for those that did not know me, I felt that they would give me the chance to become known. I’ve written my blog from my earliest days to my current. I’ve laid out my thoughts and habits out through these pages. But, not everyone has read my blog and I did not feel that telling people, “read my blog” was a good answer. I started from scratch and answered the questions as I would answer them on my blog or in a chat. After all, these questions would show people who did not know me a bit about who I was. What I saw was that the residents of low sec were passionate about low sec. That it is a large, intricate, passionate community with a lot to say and a lot that is wanted. I learned that other’s felt as ignored as I did and the ideas, desires, hopes, wants, complaints, and solutions poured out. I gathered them up. I made a google documents folder and started organizing and sorting the questions and information. It flowed. I am not yet on the CSM but I will prepare as if I have won the seat. The information people are sharing is too valuable to lose. There have been many, many things to do in just a week. I am not sure I’ve ever been quite this busy in game. I was invited to the Amarr Tea Party for an interview and then to the Capsuleer run by Angry Gamers Inc. I’ll have a third interview with Cap Stable in the near future. They have extended offers to all of the CSM candidates. The interviews are something I am just running with. I have never been interviewed for things. I’ve always kept my thoughts to my text but some people wish to hear what I have to say. I think that is fair. I am, after all, asking them to listen to me and consider supporting me. It is not unreasonable for me to take these generous offers to speak about what I am so passionate about. It is strange for me, taking them. I’ve never been one for self promotion. I link my blog to my bio and signatures but I write so often that I feel strange posting everything I write to twitter. Some days I write two to three posts and depending on my mood I may post them or schedule them for the future. I have no talent in sales. When I want something, be it article or knowledge, I go after it. It leaves me a bit puzzled about how I am supposed to ‘sell’ myself. But, that to, I shall muddle through. My corpmate, Kooba, translated my CSM post into German and posted it on the EveGer forum. The boys spam “Sugar Kyle for CSM” when they are out roaming. I have visitors to my chat who want to see what I am like day in and day out. A week in and it has already been a wild ride. I’ve never been in this position before. But, I think I’m steaming along quite well. I’ve caught up with my thread. There is an entire field of candidates now. I have a few more threads to answer but I decided to sit and ponder the posts. I have written a lot this week and more than one person has told me that they don’t want me to burn out with my excitement. I take that advice to heart. I to do not wish to become a burnt out husk of myself. And so, whenever I’m stressed I have a simple fallback. I stop, take a break, and play Eve Online. It’s working rather well. Oh yes... I almost forgot. My boys... oh my boys. They are spamming "Sugar Kyle for CSM" after every fight and gank and naming their ships after me so that the wrecks will be named. A rolling wave of violent advertising is my corporation. I can only smile and laugh. Nice post. The decision to run for CSM can not have been easy. The announcement marked your transition from a (well known and respected) blogger to an EVE personality. With this will come anonymous internet dumbassery, demands ignorant of the powers of CSM and - the worst of all - the requirement to eventually reveal your real name. That alone would make me stop at the "post" button, although many times I asked myself what I would do as CSM (I am sure every engaged EVE player asks him/herself that frequently). So, kudos for just running, making that step and exposing yourself to the worst that EVE has to offer. Your "boys" - and hopefully many others - represent the best of EVE, a true community of engaged, anarchic and slightly weird adults caring about each other more than just caring about pixels. I do wish that it did not come with the 'eve fame'. But one cannot always pick all of the cooked carrots out of fried rice (carrots are to be eaten raw). I did think things over quite well. The real name and everything else that comes with it. But, it is a decision I'm comfortable with making. And the boys... well... they are mine. I do love them and sometimes it is for better and sometimes it is for worse. But every day I look forward to talking to them. I'll keep claiming them and I'll be vocal about it. After all, they are part of my Eve experience and one of the things that motivates me to enter into this type of thing. Although I don't play EVE anymore, I still lurk about the EVE blogosphere. Yours is one of a handful of blogs I read from time to time. Given my history in the game and on the CSM, I am obviously biased, but I think every CSM term should include at least one person who can offer a passionate, experienced Low Sec perspective. Seems to me that you are a good candidate for that role. Best of luck in getting a seat on the CSM! Hey! Don't abandon boosters and TCS in your campaign! Many people would vote for you because of your trading. Just because we don't run over to spam on the forum, we exist. With many accounts, each can vote! Maybe you could write a "Sugar on trading/industry" post that we can spam on our channels/blogs. 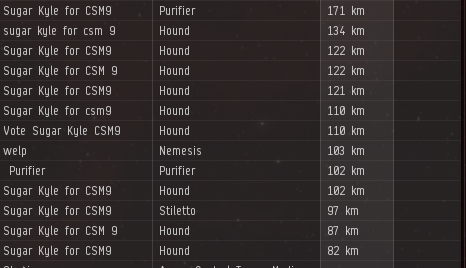 We don't fly Hounds , and no one dscans Jita gate for Freighter names. I'm not abandoning anything Gevlon. It is just an example of decisions and priorities which I do have. Everyone lists things close to them or interesting to them but I doubt the CSM has the ability to bring everything forward and hard decisions have to be made.